Last year I had the immense pleasure of sharing a couple of tour dates with the wonderful Nick Petrie. 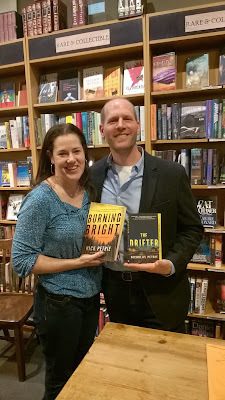 The author of the Peter Ash series, heir apparent to Lee Child's Jack Reacher series, Nick is a terrific writer and friend. One of the highlights of the Toronto Bouchercon was wandering the streets on an epic 3-hour walk with Nick, during which we discussed life, literature, and the mystifying number of vegan bakeries we passed. 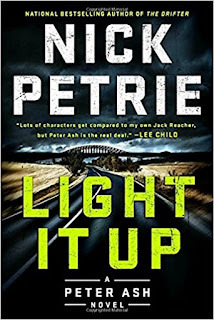 Nick's newest book in the Peter Ash Series, "Light It Up" will be out on January 16, and it's fantastic. Nick was kind enough to chat with me recently, and he'll be here today to answer your questions. INGRID THOFT: “Light It Up” focuses on the legal cannabis industry in Colorado and the birth of a related security industry. I was particularly interested in learning about the intersection of those security firms and veterans, a fact that dovetails perfectly with Peter Ash’s background. Can you tell readers a little bit about that? NICK PETRIE: I first learned about this in a series of article on the subject in the New York Times. Because of federal banking rules, the recreational cannabis industry, now legal in six states, has little to no access to the banks. They can’t write checks or accept credit cards. They pay their suppliers, their employees – even their taxes – in cash. And their product is lightweight, portable, and very valuable. At the same time, small security companies are springing up, many owned and staffed by veterans, to help protect cannabis entrepreneurs from those challenges. I’ve talked to many veterans who really miss the sense of mission and camaradarie they had in the military, and this work checks a lot of those boxes – plus it provides badly needed jobs for veterans. From a crime writer’s point of view, this setup was irresistible. Guns, drugs, and money – what could possibly go wrong? IPT: Is there a type of scene you particularly enjoy writing? Action? Dialogue? Description of settings? NP: I love all of those kinds of scenes, but I think my favorite is the moment of gathering tension before the characters do something big and emotional. That might be an act of violence, a personal confrontation, or a move toward some kind of discovery or revelation. I really enjoy that moment when the emotion and tension are building, but still held in check. For some reason, I often set these scenes in the dark, or in a car – or in a darkened car – where the characters are with each other, but not necessarily looking at each other. Waiting. Funny, I never seem to write these scenes on purpose – they just develop naturally. At first I think I’m just killing time, but eventually I realize that something else is happening. These scenes tend to use all the tools you mentioned above – setting and description, along with dialogue, to create that mood, which usually leads to action. IPT: I loved seeing the names Jon Jordan and Ruth Jordan appear as character names. Am I right in assuming this is in honor of our Crimespree friends? How did that come about? NP: This is absolutely in honor of Jon and Ruth, the founders, editors, and publishers of "Crimespree Magazine," founders and head potentates of the Murder and Mayhem in Milwaukee crime fiction conference, and multiple past co-chairs of Bouchercon. One of the pleasures of being a writer is that you can toss in these little Easter eggs for people you love and admire. I have the great luck of living in Milwaukee, just a few miles from Jon and Ruth. Before my first book came out, they took me under their wing and gave me the best introduction to the crime fiction community anyone could ask for. Unfortunately, as so often happens in crime fiction, Jon (the character, not the human) had to die. But that was part of the fun. I’m so glad and proud to be part of their community. 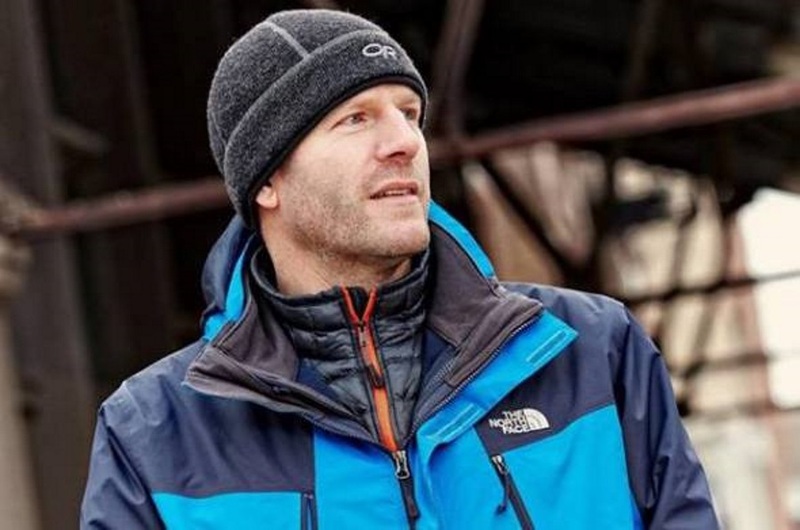 IPT: What’s next for you and Peter Ash? NP: I’ve finished a good working draft of Peter #4, which is set in Memphis, and I’ll be diving into edits while on tour in mid-January. Tour events are on my website, www.nickpetrie.com, and also on my Facebook page. I’m also thinking quite a bit about Peter #5, which will be set in Iceland. I already have a fair amount of early thinking done on it – which is very unusual for me – so I’m really looking forward to seeing that book unfold. 2018 is already getting quite full – I’ve been invited to the Tucson Festival of Books in March, I’ll be at Thrillerfest in New York in July, and of course Bouchercon in Florida in September. Plus my son and I plan to go back to Iceland this summer, to circumnavigate the island in the name of literary research – we have a great time bumming around together. Then there’s that book to write…. IPT: Those pesky books! Always needing to be written! Not only will Nick be here to answer your questions today, but he's also giving away a copy of "Light It Up." Just comment to enter! Congratulations on the new book, Nick . . . it’s always good to have a new Peter Ash story in the teetering to-be-read pile. With such a timely tale, I wonder how folks in Colorado [or in any of those other five states] are adapting. Are the citizens generally supportive of the businesses? And how do the businesses feel about being “second-class citizens” insofar as their businesses don’t have the access to banks and such?? Iceland, huh? Can’t wait to read that one . . . .
Great questions, Joan. I can't speak for the citizens of Colorado, but in Seattle, cannabis has been legal for a few years with mixed results. Aside from personal feelings about legal pot, I think there is a sense that we're losing potential tax revenue since technically it's still illegal in the eyes of the federal government. Thanks for the congrats and sorry to be late chiming in -- got a kid staying home from school today. I agree with Ingrid -- it's a mixed blessing. Colorado is still harvesting taxes, but it's a very different feel, depending on where you are. In Boulder, for example, I couldn't walk down the street without smelling it in the air, and at night there were plenty of stoner kids hanging around. For people in the industry, the federal banking piece is both frustrating and dangerous -- it's expensive to to business in cash. My main complaint about the legalization is that in my downtown Seattle neighborhood, I smell it constantly. I always joke that by the time I get to my gym (a five-minute stroll from home,) I have a case of the munchies! Ha! Yeah, it's one thing to smell a hint on the air in a college town, it's another entirely to walk through a cloud of pot smoke in a downtown business district. Quite surreal. And I've neglected to mention -- where are my manners? -- thanks so much for having me at Jungle Red! It's quite an honor to be with this distinguished group of writers. Congrats on the new book and good luck with the edits while you are touring. That's very ambitious, Nick. I usually just crumple into a heap at the end of a touring day! I get a lot of work done on the plane. My trick is that I don't pack a book -- and I get bored easily, so I might as well do some edits... At the end of the day, thought, I'm both wired and exhausted. Often there's a cocktail and a rapid spiral into sleep. Even though I wasn't in control of this decision, I wholeheartedly approve! We'll be tour buddies again in the future, no doubt! Exciting news! I loved the first two Peter Ash books, and can't wait to read this one. Congratulations, Nick! What an interesting take on a modern phenomenon, and you're right. How could a crime/action writer resist a topic and setting like this? All good reviews and smooth sailing with your new book, and your next ones! Thanks Gigi -- let me know how you like LIGHT IT UP! Congratulations on the newest book, Nick! I also loved the first two Peter Ash books...Burning Bright was on my top reads of 2017. The legalization of marijuana is a timely topic not only in Colorado. Here in Canada, the federal government has enacted legislation to make the sales of recreational marijuana legal by this summer. Our provincial and municipal governments are scrambling to figure out how to implement this in time. And I been to Iceland twice in the winter...I am looking forward to seeing how you use this research into another book! Nick, can you tell us a little bit about being dropped in the middle of nowhere in Iceland? By choice. Oh, Iceland. My sixteen-year-old son and I went to Hornstrandir National Reserve for a 5-day backpacking trip. There are no roads to this part of the park, so we went in by boat. No dock at that part of the park, either, so we went from a small boat to a little orange inflatable Zodiac, which the pilot drove up onto the flat rocky beach. We hopped out and the Zodiac putt-putted away into the mist, and there we were. It felt like falling off the edge of the map -- simultaneously scary and glorious. The legal cannabis thing is really interesting to watch -- and even more so now, with the Attorney General recently announcing he's going to roll back the previous administration's non-enforcement policy. Things may get very strange before long. That must have been an amazing experience, but eerie, too. One doesn't often feel cut off from the world these days. There's a great podcast called NOTE TO SELF that's all about modern technology and creativity. I've found it enlightening and helpful. I'll check out the podcast. I find it hard to focus among the noise of social media and technology. Social media, in particular, seems to generate a false sense of urgency: THIS IS IMPORTANT AND YOU MUST READ IT NOW, and I'm looking at pictures of Prince George. I'd throw out my phone if I didn't need it on the road. But of course I'd never do that because I LOVE my phone, too. Sigh. Congratulations on the book! I confess, you are a new author to me (thanks, Ingrid for the intro), but I think we are soon to be old friends. What an intriguing premise. Never thought about the banking aspects of the legal marijuana trade. Seems like someone missed a step in the legislative plan. It's a states rights vs federal law and enforcement thing. In a way, a pretty crisp encapsulation of the entire debate about local vs federal control. It was Ingrid's recommendation that got me to pick up the first Peter Ash book and I loved it. So I'm glad to continue reading the series and I'm excited for Book 3. I know you won't be hitting Massachusetts on this tour, but like you mentioned on Twitter, you might do so for the next book so I'll hope for that. In the meantime, January 16th will be a great book birthday to look forward to. I remember seeing a report (perhaps on 60 Minutes) that talked about the lack of access to banks for these pot companies. It was an interesting piece to watch despite my lack of support for the industry itself. Medicinal use is fine, but recreational is not something I'm in favor of. Thanks, Jay! I haven't seen the 60 Minutes piece, but the New York Times has done a series of articles on this -- that's one of the things that got me started down this rabbit hole. Light it Up sounds like an intriguing plot, indeed. I look forward to reading it. I enjoyed hearing you talk on the Second Book panel at Bouchercon. Have fun in Iceland, a place I'd like to visit one day. I live in Manitoba, south of Lake Winnipeg on which is the small community of Gimli ("heaven" in Icelandic, I understand) -- it's the largest population of Icelanders outside of the country itself (I think I have that right). Thanks for coming to the panel -- I love those conversations, and Bouchercon is a blast. Iceland is truly astonishing for many reasons, the people chief among them. I'm going back again this year. We met folks that were on their six or seventh trip! It's quite addictive. Great...my comment got deleted by blogger AGAIN. What the heck is going on? Like what? I'm about as boring as you can possibly imagine. Welcome Nick! what a clever man to take your son around Iceland in the name of research--that is on my bucket list. Seems like it's hard these days to write anything vaguely political--times are so toxic and the news changes so quickly. How do handle that? I've been self-employed since I was 22, and I've always had two rules -- don't talk about politics or religion at work. So I don't think of this issue as political thing, I think of it as a human thing -- how does it affect human beings, and human relationships? I also don't want to be preachy or polemical in my work -- for me, it just gets in the way. Hurray Nick! 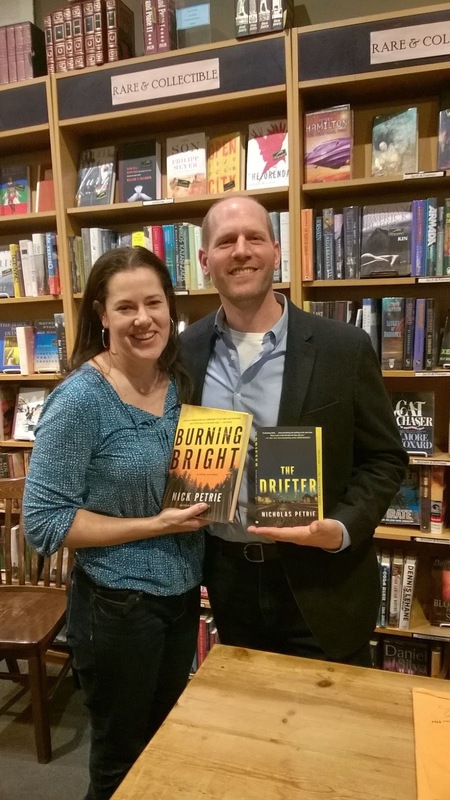 And your books are terrific… And we will be together in Scottsdale on January 15, right! At the amazing Poisoned Pen . And I laughed out loud at your dilemma with Jon. Somehow, it really bothers me to kill off the character with the person’s name someone bought in an auction. I never plan for it to happen, but then… It does. And, no spoiler here, but your truck going down the mountain Scene was one of the best ever! I agree, Hank. Nick nails it when it comes to sucking the reader in right from the get-go! I didn't mind killing Jon -- it's more of a character with Jon's name than Jon's personality. If I tried to write a character with Jon's real personality, there would be 2 problems: 1) I could never do justice to the real Jon Jordan, and 2) nobody would believe that character was real, because Jon has such a big and distinctive personality. Mostly I wanted to acknowledge the friendship -- Jon and Ruth have been really good to me, and I'm so grateful to be included in that crowd. SO right! No one would believe it. xoxo . And yes, they are amazing. What a timely topic! The new book sounds great. Congratulations! Iceland! Good place to set a mystery novel. For a small country, it has vast emptinesses and tons of sky(though so does Colorado). And of course the time of year makes a huge difference. Winter of summer? Congratulations on the book, Nick! I would imagine a business that can only operate in cash with a very valuable product would be ripe fodder for plot lines. I won't say it wrote itself, because nothing does. But the drama inherent in the situation is pretty clear. I agree that this is a timely topic. My husband is a big Reacher fan and I'm going to introduce him to Peter Ash (as well as introducing myself, of course). We visited Colorado pretty soon after the legalization of cannabis and it was sort of surreal to see the shops and things. We learned about the 'cash' dealings and commented to each other that 'there's an opportunity for some crime'. Not sure what the answer to all that is, but I'm not surprised that security firms have arisen to deal with just this problem. Good luck with the new book and looking to a new series. Thanks, Kay! I'm a huge Lee Child fan myself -- his latest, THE MIDNIGHT LINE, is one of his best, if not THE best. For me, one of the most impressive things about Lee Child is the fact that he truly is getting better with each book. The man sets a high bar. Hi Nick! I somehow missed the previous two books, but I'm really fascinated by the subject/setting of this one. Is it okay if I jump right in to the series? Oh, and Nick, tell us about your research for this one! You can absolutely jump into the series wherever you like. The goal was that each book would essentially stand alone, although the characters and relationships do evolve along the way. For research, my son and I spent a week in Colorado, first backpacking in the Rockies, then wandering around Boulder and Denver. I live in a state where there's not even medicinal marijuana, so the whole thing was utterly surreal. I walked into a pot shop -- my son was fifteen and underage, so he couldn't come in -- and it felt like the first time I walked into a liquor store after turning 21. As in, how can this possibly be legal? Nick, welcome back to Jungle Reds! I met you and your wife at Bouchercon in Toronto. I have your Drifter book on my to be read books shelf. Do I need to read your books in order or can I start with the Drifter? Thanks, Diana! THE DRIFTER is actually the first in the series, and you can certainly start there -- but if you want to start with LIGHT IT UP, that's fine, too. Thank you, Nick! Since I already have THE DRIFTER, I can start there. I, too, missed your first two books, but I'm looking forward to catching up on what sounds like an intriguing series. Best of luck with the new book! Thanks Mary! Hope you enjoy it -- let me know what you think? Congratulations on this intriguing release. Wishing you happiness and continued success. I enjoyed learning about the author and his writing. This novel would be fascinating and enthralling. Thanks for this great feature and giveaway. Thanks, all! I have some non-fiction stuff on my website, too -- how the first book came to be, what it's like to write the second in a series (when you hadn't planned to write a series to begin with) and a few other pieces out there on the Interweb. I wrote a fun bit recently in Bookreporter on falling in love with pulp fiction as a kid, when my Mom and Dad bought me a tall stack of Doc Savage books. Just google NICK PETRIE DOC SAVAGE. Nick, you need to make up T-shirts that say, "Jon Jordan Must Die." I guarantee they will be sellouts at every mystery conference you attend this year. Ruth Jordan actually has a role in Robert Crais's books as Elvis Cole's contact at the phone company. Makes me smile just to think about it. LOL - I love Julia's idea! Hilarious. Congratulations, Nick, on the release of your new book. 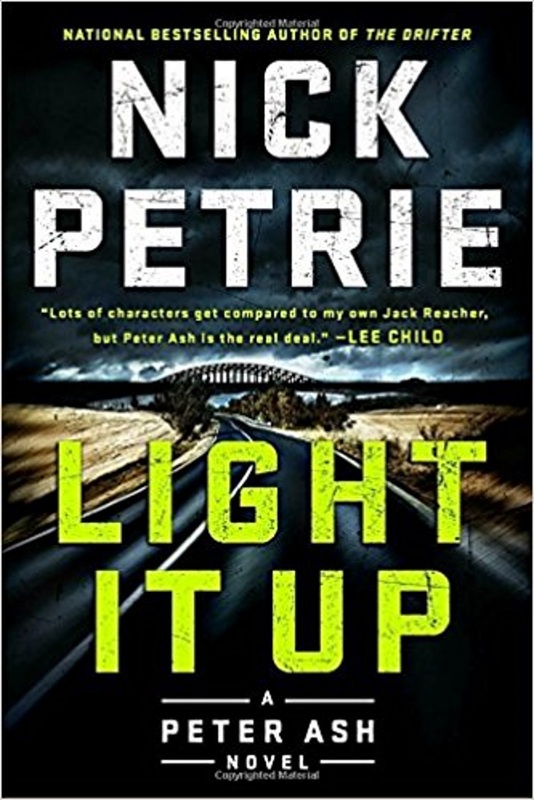 Having recently been to CO, I am really looking forward to reading LIGHT IT UP. The Hub and I are both huge fans of your work and enjoyed seeing you at the Poisoned Pen last year with Ingrid. Memphis and Iceland? How do you pick your settings? Which are fantastic, btw. Looking forward to more Ash! Thanks for coming to hear us talk! On setting, it's funny, but the settings kind of choose me. My Colorado book wasn't supposed to be set in Colorado, or have anything to do with legal marijuana -- I was going to write about Detroit, a city that has always fascinated me. I kept writing the same 10,000 words over and over -- the book just wasn't going anywhere. But I had a chance meeting in an airport that really captured my imagination, and suddenly I found myself writing about Colorado! For the Memphis book, I thought I would write a natural disaster book -- there's a huge earthquake zone near there called the New Madrid Fault Zone -- but the book went in a totally different direction. I wasn't planning to write about Iceland, either, but my son had always wanted to go, and once I got there, it just seemed like a perfect place to drop Peter Ash. I haven't started that one yet, but it's taking up a lot of mental real estate right now. I've got to get caught up on your books! They sound great! My big brother lives in Colorado so I make snarky comments about potheads from time to time. Only because I am tired of his general snark about Texas. I had no idea about the problems with the cannabis business. We know someone who moved to Colorado to grow the stuff but don't know how they're making out. That is just so strange that it has to be an all cash business. That just screams trouble in the making. Thanks Pat! The pot business is incredibly lucrative, but also risky, not just from the cash aspect but from an enforcement standpoint -- as the Attorney General's recent announcement makes clear. Also, as more folks are getting into the business with this gold-rush mentality, competition is going up and wholesale prices are going down. Early days yet, but wow, is it interesting to watch. This sounds like a cool series. Always glad to hear of a new one, especially one recommended at JRW. I'm looking forward to meeting Peter. And thanks for the pointer to NOTE TO SELF; sounds like something I can use. Hope you like it! I'm a podcast junkie, especially stuff that helps me figure out the modern world. I also really love HOW I BUILT THIS, another podcast about people who have started companies or social movements. My favorite advice regarding social media: Never compare your "behind-the-scenes" tape to someone else's highlight reel. Very nice! I'll have to remind myself of that on a regular basis. Yes--there's some author--who? Oh, I think Brad Meltzer. Who tells the story about when he submitted his first book. He got more rejections than submissions. He alleges some editors sent two rejections, just to make sure he knew they didn't want it. Added to the TBR stack! I don't know how I missed hearing about this series, but it sounds great! Thanks for having me, Jungle Red Writers and readers! Great to be in your company. Thanks for visiting the Jungle Reds and letting us know about your new book! I'm so glad that you are writing about the cash side of the cannabis industry in Colorado -- that side of it has always intrigued me -- and I can't wait to read Light it Up. Living up here in Colorado, I am surprised I don't read about weekly heists of all the cash revenues -- even the t-shirt/souvenir shops at dispensaries can only take cash.